Since returning from the Galloway Hills, it has been a busy week of roe and rain, but it’s worth quickly mentioning that I’ll be at the CLA game fair tomorrow (Friday), and it would be good to meet any readers of this blog as I work my way through a shopping list which includes a new stalking knife, some proper socks and a snow camouflage jacket. At the same time, I plan to plunder the bookshops, steal ideas from the artists and try out a range of new trout rods after my current favourite was deemed “too stiff” for lightweight brown trout – (I’m sure there is a more precise way of describing this). Hope to see you there – mine’s a pint of cider. 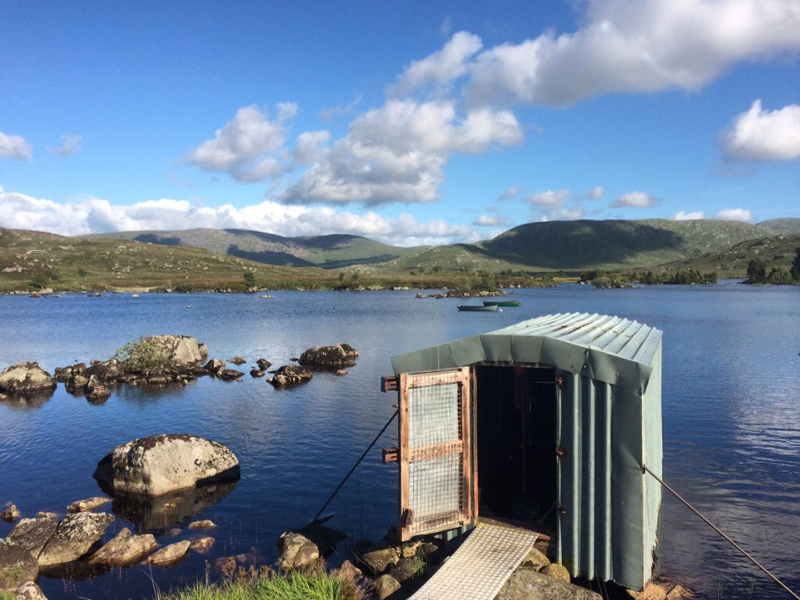 In very brief, it is certainly worth mentioning a stunning fishing trip deep into the wild terrain of the Galloway/Ayrshire border over the weekend. It would take several blog articles to adequately capture the full delight of three days on the water amongst shoals of brown trout, tumbling eagles and the eerie lowing of black throated divers, but suffice to say for now that it was a phenomenal trip, and reaffirms every ounce of pride I ever had that I was born in the Southern Uplands. All that remains is for me to slough off my sunburnt skin like an adder and get back to work. 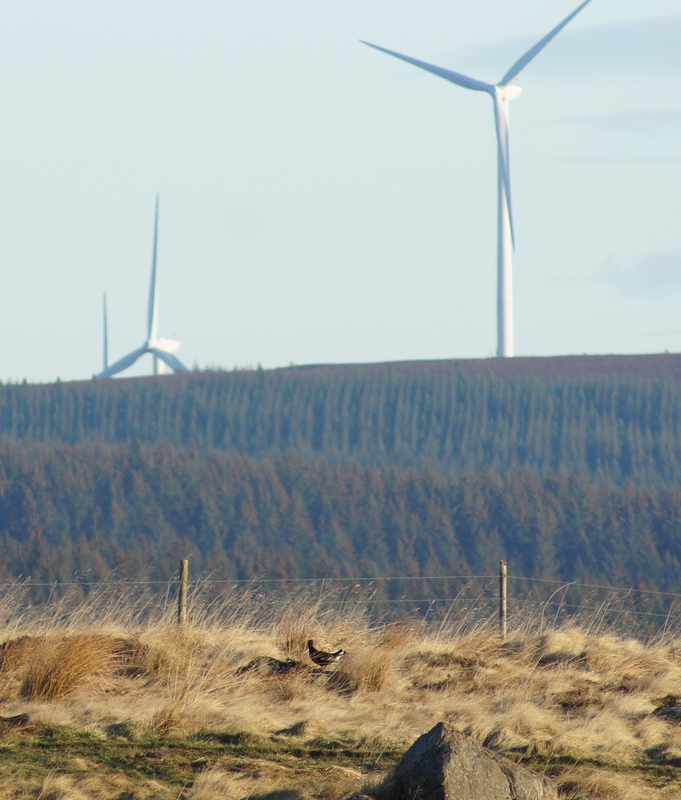 It has been interesting to read through the feedback from my recent post about windfarms and forestry, particularly since it has raised some interesting new ideas about the imbalance between forestry and renewable development. From a landowner’s perspective, the various voices from within the renewables world have spent the past ten years dangling enormous sums of money before our eyes in return for the prospect of development. Several developers have gone so far as to say that we would be offered “silly money” to go ahead with development and that we would be “more than compensated” for our pains. Massive sums are allocated to mitigation work, and one company explained that it was sometimes “hard to get rid” of funding for habitat management plans, so copiously were they loaded with cash. I might have been trying to stir the pot when I suggested that the foresters should have paid compensation for the harm they did, but in a world where there was essentially no precedent to compensate or mitigate the damage caused by industrialisation in the uplands, where did the renewables companies get the idea that they were obliged to cough up? A great deal of the anti-windfarm impetus comes from the aesthetics of turbines themselves. Locals don’t like looking at them, and there is a perceived (although probably rather shakily proven) threat to tourism in a countryside littered with whirling blades. The surprising thing is that the kind of commercial plantations installed over the past forty years are every bit as aesthetically offensive as turbines. They lie in geometrically perfect blocks across undulating hillsides; great corrugated slabs of identical green trees are hideous to look upon, but despite initial revulsion, the general public seems to be able to forgive them as the years go by and the trees gradually insinuate themselves into the landscape. Many of my friends come to visit from the city and they see nothing wrong with lines and rows of sitka spruce far off to horizon. They just see trees, and they assume that the collective noun for trees is “forest”. Our baseline perception of normality changes with every generation, and having grown up surrounded by plantations, I accepted them until it dawned on me precisely what the cost had been to host these devastating timber factories. So maybe it’s just the fact that turbines are so clearly unnatural that means that the entire renewables sector is set up to pour money like oil over troubled waters. The quantity of money offered to us as landowners has sometimes been obscene; far out of proportion with the impact that the turbines would actually cause us. I’ve said this to the renewable companies, and they have nodded in agreement. This is such an extraordinarily different approach to effecting land use change in the uplands that it takes some getting used to. The foresters came from a system which rewarded willing landowners with tax breaks and left neighbouring communities to “go hang”. Now the renewables companies offer to spew money all over entire communities in exchange for comparatively slight, relatively temporary aesthetic damage. If the prevailing atmosphere had not been so embarrassingly opulent, we might almost have felt like the renewables “system” was (at least in part) predicated on apology – “we’re sorry about the turbines, but here’s some cash to smooth things over”. Interestingly on the flip side, I met an undergraduate engineer at University who believed that landowners should get nothing for the turbines on their land – hosting renewables was a reward in itself, and that landowners should be environmentally conscientious enough to do the “right thing” without any financial incentive. I wonder what happened to her. To their credit, the foresters now do spend a huge amount of (public) money on fixing the damage they caused, and while I would rather they hadn’t done it in the first place, there are some refreshing signs of progress. But it is interesting to consider that these two industries boast many of the same benefits: they bring employment to remote areas and they promise a more environmentally sensitive future – and yet in terms of financial mitigation for damage caused, it could be argued that foresters offer nothing and renewables offer too much. 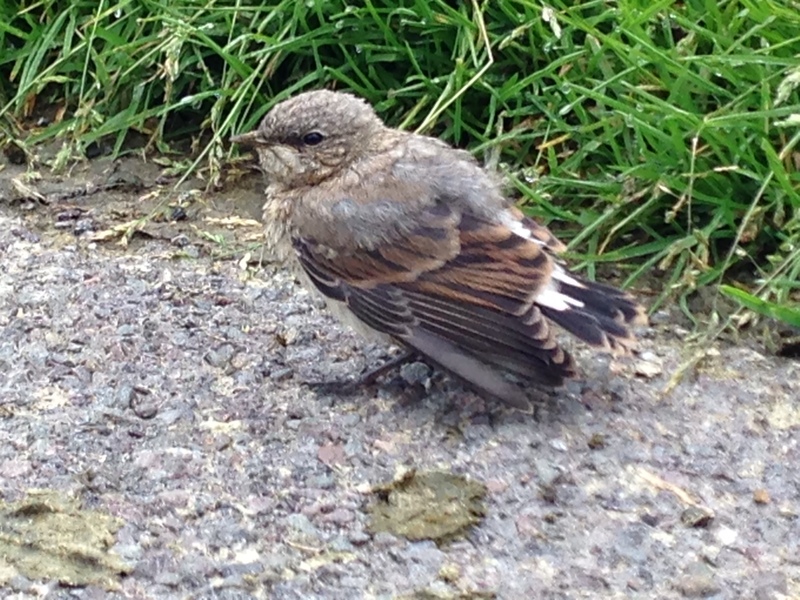 Couldn’t resist quickly posting this picture of a wheatear chick found on the road this afternoon. He must have stepped out of the nest a matter of hours before I saw him, and his wings were taking some getting used to. They flopped around beside him, and he moved around in a fumbling, foolish series of stumbles until he finally managed to get above the shelter of the rushes, at which point the wind caught him and he sailed beautifully off over thirty yards of thistles and ragged robin to perform a beautiful ballerina’s landing on the dyke top nearby. As much as he delighted in this little victory, it won’t be long before he’s staring down the barrel of a rather more demanding journey – all the way to East Africa. Despite his grey, chick-like anonymity, his little white tail was well pronounced in miniature, and as I approached him to take this picture, he bobbed and ducked in quiet imitation of an adult bird. I wished him well and drove up onto the moor, where a peregrine slid at speed through spots of rain. Snipe cowered beneath the asphodel and waited for him to vanish down towards Dalry, and then they crept quietly out again like snails from their shells. What’s a blackcock to do? Caught between tree farms and windfarms. Windfarms have become the new Galloway buzzword. Nowhere else in Scotland has attracted such a huge amount of attention from the wind developers, and over the past ten years on the Chayne, over a dozen different companies have expressed their interest in one capacity or another. The various development reps have not exactly covered themselves in glory during that time, and the individuals involved have ranged from the absurd to the bizarre. We’ve been to meetings with fat-bottomed hoorays in mustard coloured corduroy trousers who advised us to take the money and run. We’ve been poked, badgered and prodded by black suited corporate types who think that massive financial pay-offs are the key to unlocking any door, and we’ve even had spotty-faced “dress-down” graduates who have quietly mumbled about the philosophical imperatives of climate change. We’ve seen it all, and the overall impression was that wind development (particularly in its early days) had nothing to offer the countryside beyond theoretical idealism and stacks of money. We’ve seen the kind of culture-clashes between bird surveyors and hill shepherds that wouldn’t have been out of place in the context of Columbus landing in the New World, and the result has been frustrating, extraordinary and (above all) fascinating. I think Dumfries and Galloway is fast approaching a saturation point for wind farms, but my reservations are only moderate. Great herds of whirling turbines are not my idea of beauty, but some of the anti-development groups roll their eyes with fury every time they see a turbine blade. They argue that each new turbine (I like calling them “windmills” – developers just can’t resist correcting me) is another nail in the coffin for “nature”, and that these developments are ruining a pristine wilderness. From my perspective, the impact of turbines is immeasurably less devastating than the real damage caused when Dumfries and Galloway was planted with commercial woodland forty years ago. 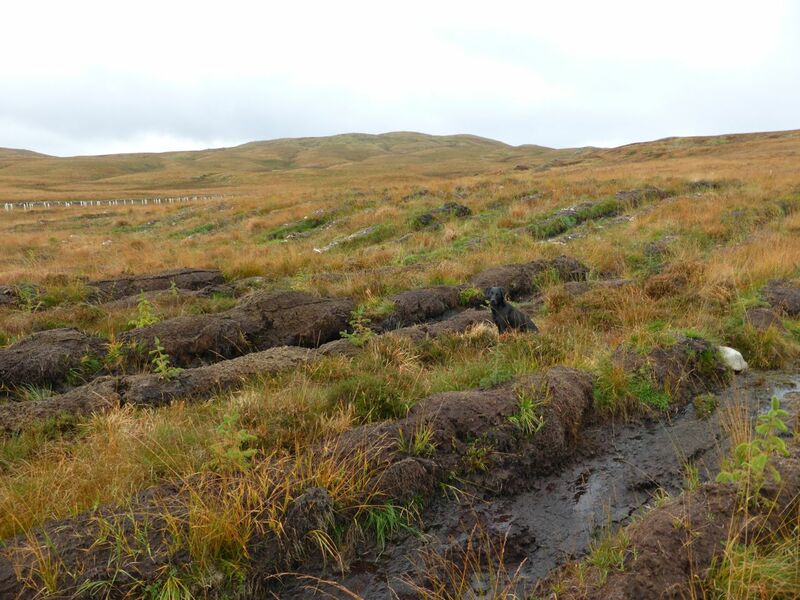 During a few short decades, foresters caused incalculable, irreparable damage to hundreds of thousands of acres of our uplands, turning the hills into forests overnight without a second thought to the consequences. So blindly focused were they on the production of timber that nothing escaped their ploughs, and in the light of all the decline that has taken place since, arguing about a few wind turbines seems like rather small fry. In a very real sense, the “wild Galloway” horse bolted years ago. The impact of wind turbines is little understood in the long term, but I am quite convinced that it is less harmful than the brutal conversion of moorland into forest. Besides, to mitigate the damage caused by wind development, huge amounts of money go to local landowners and communities, and funds are established to manage habitats so that biodiversity is retained and enhanced. The Forestry Commission were not obliged to spend a penny on mitigation when they devastated the uplands in a far more permanent, graphic way, and that absence is almost perverse by comparison. Imagine the uproar and fury from conservation groups if wind farms extirpated black grouse from an entire county – but the foresters did it twenty years ago and nobody batted an eyelid. Quiet, uncomplaining Dumfries and Galloway has again become the dumping ground for a new “revolutionary” land-use fad, but as the horizons crowd over with whirling turbine blades, it is reassuring to think that they will all be pulled down or replaced in twenty years time. The damage caused by planting is immeasurably more harmful and will never be undone. I am not a natural fan of wind development, but it appeals to me because it can be integrated into other land uses – it can complement and improve what we already have. By comparison, forestry tends to compete with other land uses until it dominates them on a tidal bore of public money. More turbines are due to appear across the Galloway Hills over the coming years, and I welcome them if for no other reason than that they represent the lesser of two evils. 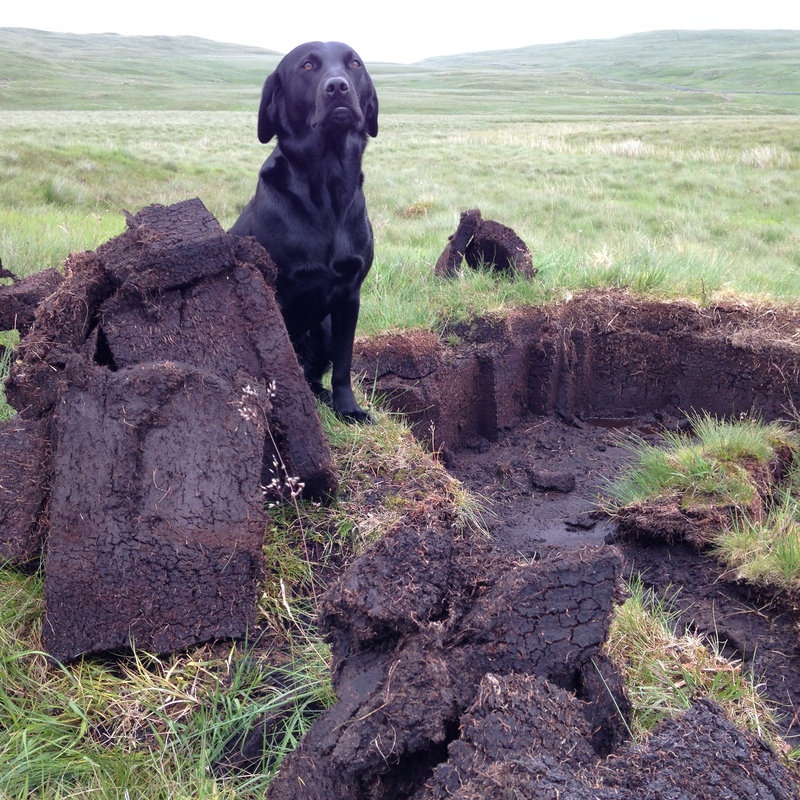 It has been an odd year for drying peat. The May wind was thorough and chased away the water, but since then the damp and the rain have soaked in to parts where the skin had not formed, and many of the most promising peats are now as crisp as biscuits on top while soggy and soluble below. I have managed to lug a few bags off, but the majority could still do with some more warm days before moving. The solution would be to dry them on high in a big stack, but the cows are magnetically drawn to anything that rises more than eighteen inches off the moor, and previous stacks have been reduced to crumbly fragments by their lumbering curiosity. As it is, I have to stack them in long, low mounds which are prone to staying wetter for longer. Last year, the tallest peats were constantly strewn with the remains of butchered voles. Kestrels and (by night) owls would carry their prey to be eviscerated on the nearest high point, and some of my peats were coated in dried gall bladders and the noses and whiskers of rodents which are so carefully removed before eating. The voles have crashed this year, and I seldom see any kestrels on the hill as a result. Notes from last year describe encounters with broods of young kestrels, sometimes combining with others to form loose gangs of nine or ten along a single mile of moorland track. This year, I would be lucky to see a single kestrel on a walk round the hill, and the owls seem to have failed as well. These things work in cycles, but it is always surprising to see how dramatic these can be. It’s fascinating to see how birds and wildlife respond to a bad summer. Driving out of Dumfries yesterday, I passed a female lapwing with a brood of two day-old chicks at heel, wandering carefully through a recently mown silage field. Nearby, a flock of twenty full-grown lapwings looked on; one of the hotchpotch gangs of immature birds and non-breeders which drift around the countryside all summer. It was only after close examination that I saw the tiny little chicks at all, and it would have been easy to miss them. 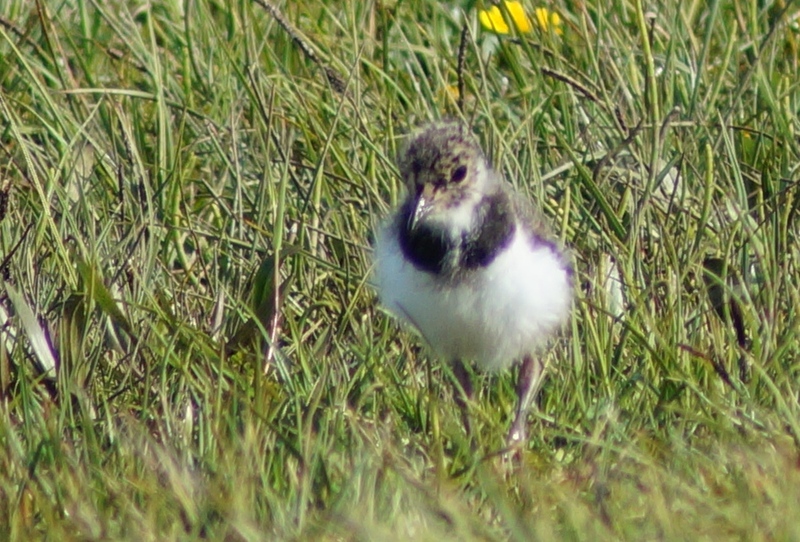 On North Uist six weeks ago, there were lapwings chicks on the verge of fledging, and several youngsters were bouncing around with their wings up after what seemed to have been several days of practice. At the same time, there were some tiny chicks still darting around in the silverweed, and it seemed amazing that these youngsters were even the same species. A staggered hatch is one thing, but the little chicks I found in Dumfriesshire would not even have been laid as eggs by the time the North Uist birds were flying strongly on the wing, and this seems to have been the case for several species this year, grouse included. There are all kinds of explanations for staggered hatches, and this year it almost makes sense to have held off rearing young until now; the habitat is much further on now than it was when the first clutches were being laid, and the undergrowth actually looks far more promising now than it did in May, when it was cold and grim. Unfortunately, staggered hatches lead to chicks at such a wide variety of ages and stages that predation pressure often has more of an impact. When all the eggs hatch at once, the grass is filled with tiny chicks and the little waders can have a certain mass momentum which sees them through. When they hatch in dribs and drabs, there is always a brood at its most critically vulnerable stage, and studies suggest that predators are harder on young birds in years when the hatch is staggered.